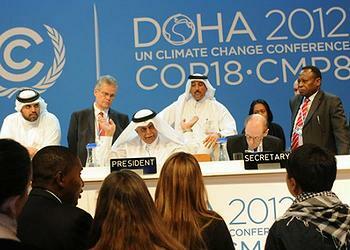 DOHA, Qatar, December 8, 2012 (ENS) – At the UN’s annual climate change conference just concluded in Doha, 194 countries agreed to an extension of the Kyoto Protocol through 2020. But the second phase still omits the world’s two biggest greenhouse gas emitters – China and the United States. Without agreement at Doha the protocol would have expired in just 23 days. Governments agreed to work toward a universal climate change agreement covering all countries from 2020, to be adopted by 2015, and to find ways to scale up efforts before 2020 beyond the existing pledges to curb emissions. They agreed on a path to “raise the necessary ambition to respond to climate change,” which has devastated many parts of the world with extreme weather this year. They also endorsed the completion of new institutions and agreed on ways and means to deliver scaled-up climate finance and technology to developing countries. “Doha has opened up a new gateway to bigger ambition and to greater action – the Doha Climate Gateway. Qatar is proud to have been able to bring governments here to achieve this historic task. I thank all governments and ministers for their work to achieve this success. Now governments must move quickly through the Doha Climate Gateway to push forward with the solutions to climate change,” said the conference President Abdullah bin Hamad Al-Attiyah. The Executive Secretary of the UN Framework Convention on Climate Change, UNFCCC, Christiana Figueres, called on countries to swiftly implement what has been agreed in Doha to keep the planetary temperature rise below the internationally agreed maximum of two degrees Celsius. “The UN Climate Change negotiations must now focus on the concrete ways and means to accelerate action and ambition. The world has the money and technology to stay below two degrees. After Doha, it is a matter of scale, speed, determination and sticking to the timetable,” she said. In Doha, governments endorsed the selection of the South Korean city of Sondgo as the location of the Green Climate Fund and the work plan of the Standing Committee on Finance. 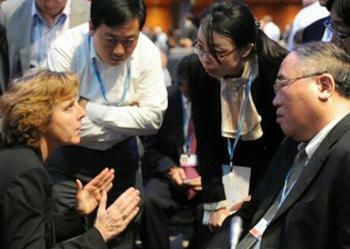 The Green Climate Fund is expected to start its work in Sondgo in the second half of 2013, which means that it can launch activities in 2014. Delegates also confirmed a consortium led by the UN Environment Programme as host of the Climate Technology Center, for an initial term of five years. For long-term climate finance developed countries have reiterated their commitment to deliver on promises to continue long-term climate finance support to developing nations, with a view to mobilizing US$100 billion both for adaptation and mitigation by 2020. The agreement also encourages developed countries to increase efforts to provide finance between 2013-15 at least to the average annual level with which they provided funds during the 2010-2012 fast-start finance period. This is to ensure there is no gap in continued finance support while efforts are otherwise scaled up. Germany, the UK, France, Denmark, Sweden and the European Commission announced concrete finance pledges in Doha for the period up to 2015, totaling approximately US$6 billion. While environmental groups were disappointed that governments did not accomplish more in Doha, extension of the Kyoto Protocol was viewed as an achievement. “We are relieved to see countries coming together at the last minute to renew the Kyoto Protocol, even without some key players, because this is the only legally-binding agreement we have and therefore extremely important to maintain it and hopefully build on it when we achieve a global treaty in 2015,” said Rebecca Chacko, senior director for climate policy at the U.S.-based Conservation International. Many environmentalists were bitterly disappointed in the outcome. “What science tells us and what millions of people experienced this year is that fighting climate change is now extremely urgent. Every year counts, and every year governments do not act increases the risk to us all,” said Smith. “It is a terrible and a terrifying irony that, while the efforts of the global community here are moving at a glacial pace, the world’s glaciers are now actually moving – or rather melting – even faster,” warned Boltz. Tasneem Essop, head of the WWF delegation to the conference, and other environmentalists draw hope from the determination of civil society to motivate governments to make big cuts in greenhouse gas emissions. 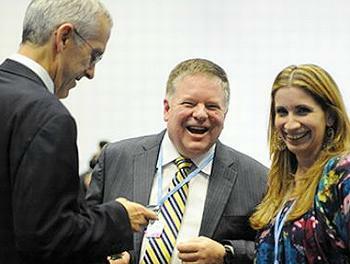 The next major UN Climate Change Conference will take place in Warsaw, Poland at the end of 2013.